We are almost halfway through January. Have you given up on your New Year’s resolutions already? I hope not. I’m still in the trenches with you. While not my resolution, I know many people choose to cut back on carbs. I am too attached to my carbs to make that leap, especially since we try to not eat a ton of meat. But I understand the logic behind the decision and many people find success with carb restricted diets. One of my many carb hang-ups is pasta. I’d seen all the recipes for “zoodles” out there, and I was skeptical. Could zucchini really taste like pasta? I finally tried it. The answer: sort of. It definitely doesn’t taste like pasta, but you don’t miss the pasta either. And it definitely doesn’t taste like you are eating a giant pile of zucchini. I liked these with a side of salmon (and rice, even I’m being honest). Enjoy! 1. 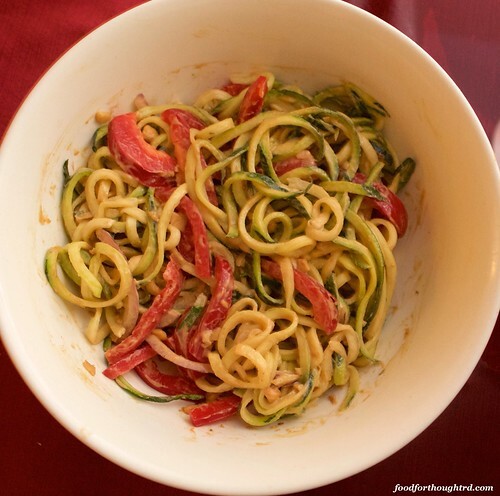 Spiralize zucchini, or make into “noodles” with a vegetable peeler. Toss with bell pepper and red onion. 2. Combine remaining ingredients in a small bowl. Stir until well combined. Microwave about 30 seconds to 1 minute, then stir again to incorporate better and it reaches a “sauce” consistency. Let cool for 3-5 minutes. 3. Toss vegetables with sauce. Serve room temperature or chilled. Recipe Notes: I know the nutrition looks a little crazy on the fat. But that is from the peanut butter, and the saturated fat is low. Through media coverage and people I know, I have been hearing more about the paleo diet recently. I even frequently see food bloggers post “paleo-friendly” versions of foods. First off, what is the paleo diet? The paleo diet is based on the idea that we would be healthier if we followed the diet our ancient ancestors did before the beginning of agriculture. Basically, a hunter-gatherer type of diet. No grains, legumes, dairy, potatoes, salt, refined sugar, or processed foods are allowed. Meat, fish, fruits, vegetables, eggs, nuts, seeds, and plant-based oils are permitted. Does the diet work? We don’t really know yet. Like most low-carb diets, there is some research showing weight loss or improved blood sugar control while following the diet. But conclusive evidence on long-term health is not available at this time. My opinion: like all “diets”, it has good and bad points. Getting away from processed and refined foods is a good thing. Eating more fruits and vegetables is also great. I don’t agree with cutting out all grains, legumes, and dairy. Bone health is one of my pet concerns, so I’m never happy to see calcium sources being cut out of the diet. Whole grains and legumes provide wonderful fiber and great protein with less fat than meat. I also read an interesting comment about the premise of this diet. The author mentioned that there was no single diet in the paleolithic era. People all over the world ate different foods based on where they were. Some people were able to gather wild grains, others weren’t. Stone-age people also often died fairly young due to the extreme conditions they lived under, making it difficult to know if the diet was actually “healthy” in the long-term. This adds further fuel to my fire. There wasn’t one perfect diet 12,000 years ago, and there isn’t one today. Eat a balanced, mixed diet of foods that will nourish and sustain your body. Happy eating! Now that it is fall, we can start talking about fall and winter squashes, which are my favorite. First up, spaghetti squash. I had honesty never tried this until last year, and I was blown away by how much I liked it. You really do feel like you are eating spaghetti! It isn’t carb free, but it is definitely lower in carbs than regular pasta. Only 10 g of carbs for 1 cup cooked squash compared to 37 g of carbs for 1 cup cooked spaghetti. 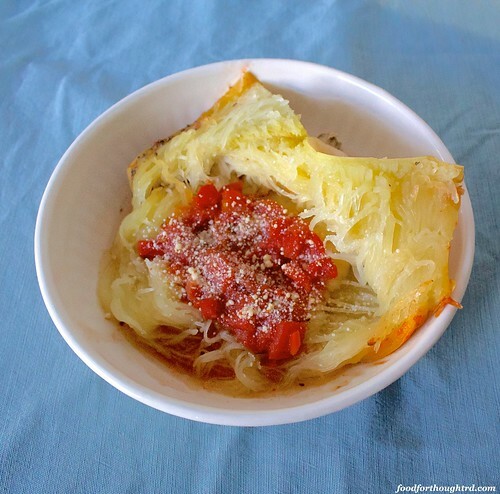 This spaghetti squash with marinara is so incredibly simple but it hits all those satisfying, homey notes of a regular spaghetti dinner. 1. 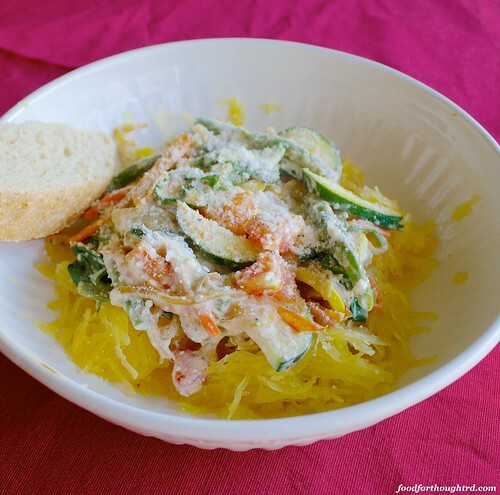 Slice spaghetti squash in half widthwise. Scoop out seeds. Pierce with a fork a few times. 2. Pour sauce into bottom of crockpot. Place squash on top of sauce, cut sides down. Cook on high for 3-4 hours or low 5-6 hours, until squash is tender when poked with a fork. 3. Remove squash. Shred pulp into spaghetti like strands. Serve with sauce. 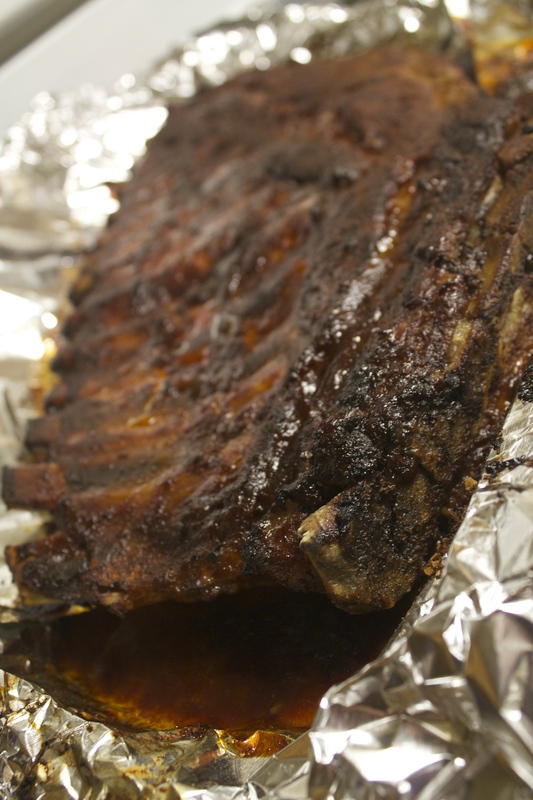 Recipe Notes: You can also cook meatballs in the crockpot along with this.